Tenor Todd Barnhill is on track to receive the Master’s Degree in Vocal Performance in May 2015. Following graduation, he will return to the Opera Theatre of Saint Louis to cover the lead tenor role, Count Almaviva in Rossini’s Barber of Seville, while performing a supporting role in Puccini’s La Rondine. Todd’s first major professional engagement is set for January 2016 where he will perform the role of Ferrando in Nashville Opera’s main stage production of Mozart’s Cosí fan tutte and Dr. Blind in their April 2016 production of Strauss’s Die Fledermaus. Todd’s current success and promising future are not coincidental. His goals for entering graduate study in voice were clear and he was equally certain about his choice of programs. Following graduate auditions he received several offers of seventy-five percent to full scholarship support from a number of institutions including Mannes Conservatory, Indiana University, Northwestern University, and Boston University. James Marvel, associate professor and director of UT Opera, is Todd’s dramatic coach. He brings a wealth of professional directing to working with students. Since his debut in 1996, he has directed over eighty productions in the United States, England, Scotland, Germany, Poland, Slovakia, Hungary, and the Czech Republic. In 2008, he was named Classical Singer magazine’s 2008 Stage Director of the Year. Marvel said his approach to dramatic training of Todd and other young singers is very individualized. “Everyone comes in with a different set of skills and abilities, and I try to tailor my teaching to the specific needs of the individuals within the class. I begin with a comprehensive exploration of how to analyze characters and roles, followed by intensive physical training in which we explore the facial mask, gesture, breathing, movement, stage combat, and footwork,” he says. Andrew Wentzel, professor of voice, has served as Todd’s voice teacher at UT. Since his debut at the Metropolitan Opera in 1985, bass-baritone Wentzel has built a distinguished and widely acclaimed career of exciting and commanding performances at many of the top opera houses and concert halls throughout the world. Wentzel brings a wealth of knowledge and experience to the instruction and coaching of his students. His strong connections to the Knoxville Opera Company afford professional opportunities for voice students that make UT’s voice program uniquely competitive in recruiting. 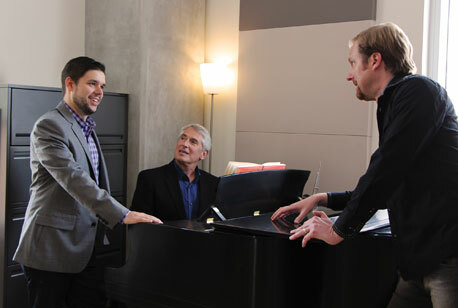 Wentzel says his role in coaching Todd is that of a team member and that each member of the voice faculty is invested in working with students to develop their gifts and hone their skills so that they might be competitive in the world of the classical singer.